Baked Rice Pudding With Mangoes. In the sweltering heat, with constant power cuts and water supply woes, mangoes are probably the only things that bring a smile on the face of every person living in India. We will gloat over the amazing bargain we got at the local market no end! Can eat the fruit every single day in all possible ways. Gift them when we visit folks and buy fewer mangoes when we expect guests who are sure to bring us some (more) mangoes. Furiously stock up on mango pickles, mango preserves, dried mangoes, mango leather, mango-everything and then mourn the end of the season! Being such a delicious fruit and a good looking one at that, mangoes have to feature in at least one or two summer posts of every self-respecting food blogger. Gosh, I have a lot of catching up to do here, as I barely have anything mango here. But that thankfully can easily be remedied! 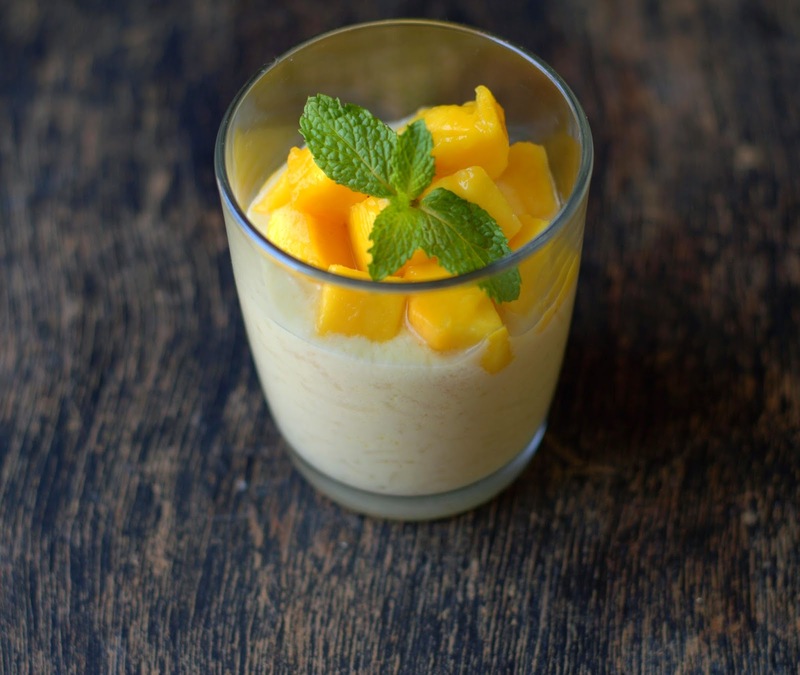 Let me start with this satisfying, homey, Mango Rice Pudding. It is similar to kheer but the creaminess comes with the eggs and in just 15 -17 minutes. You may want to try this if anything custard based immediately goes on your must-try list. And do check the whole grain version given below. You could make it with left-over aromatic rice if you have some or with brown rice and lots of dried fruit and nuts as in the original recipe. 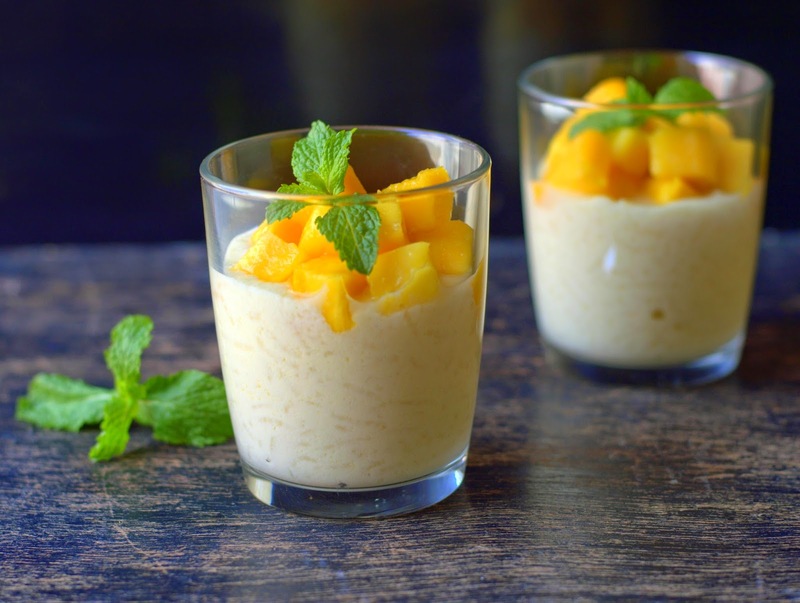 Rice Pudding With Mangoes - Based on Brown Rice Pudding recipe from the KAF Whole Grain Baking Book. Method : Lightly butter a 9'' round tin. Pre-heat oven to 160 C / 325 F.
In a medium sized bowl, whisk together the eggs and sugar till well combined. Set aside. Heat the milk in a heavy saucepan pan on medium heat, till you see bubbles forming around the edges. Stir to prevent a skin from forming. The milk will be hot, but not boiling. Stir in the butter. Whisking constantly, very slowly, ladle the hot milk into the eggs, adding just a little of the hot milk at a time. Do not rush this process or the mixture may curdle. Stir in the rice and the vanilla. Pour into the prepared pan and bake for about 15-17 minutes or till the pudding is set around the edges. The rest of the surface will look jiggly. The time may vary, be careful here. Err on the side of under baking as over baking will cause the pudding to curdle. Remove from the oven, let cool completely. Stir, spoon into glasses and chill. 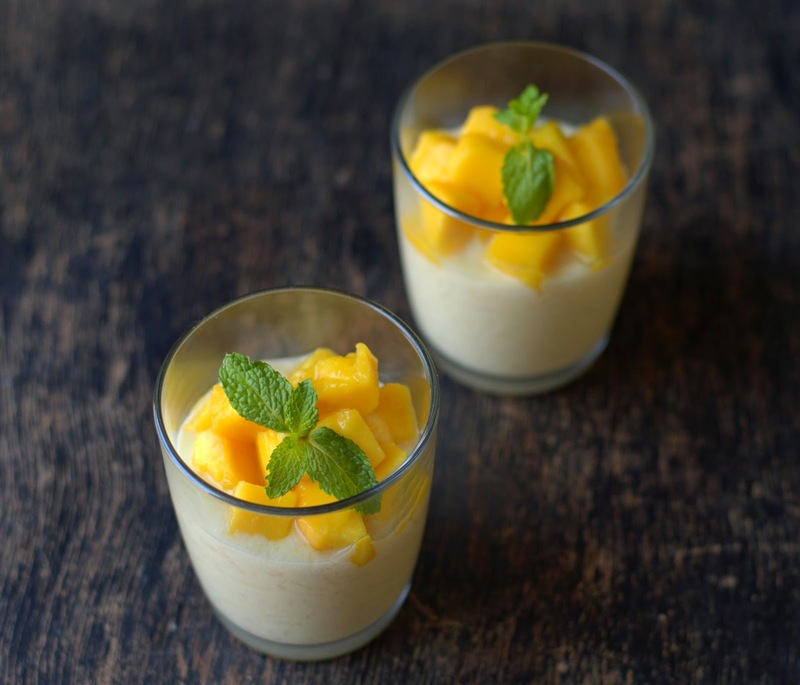 Enjoy the creamy pudding topped with fresh mangoes and sliced pistachios if you like. Please note : Do not use low fat or skimmed milk as you will not be happy with the results. Variation : The original recipe uses 1 1/2 cups cooked brown rice, 1/4 cup brown sugar, 2 tablespoons maple syrup, 1 cup of dried fruit ( apricots, cherries, raisins and cranberries), 1/2 tsp cinnamon and 1/4 teaspoon nutmeg. If you try this, you may want to increase the sugar by a couple of tablespoons. You can also subscribe to my channel on YouTube. Click to subscribe now! delicious looking dessert. I should try it... bookmarking this recipe.